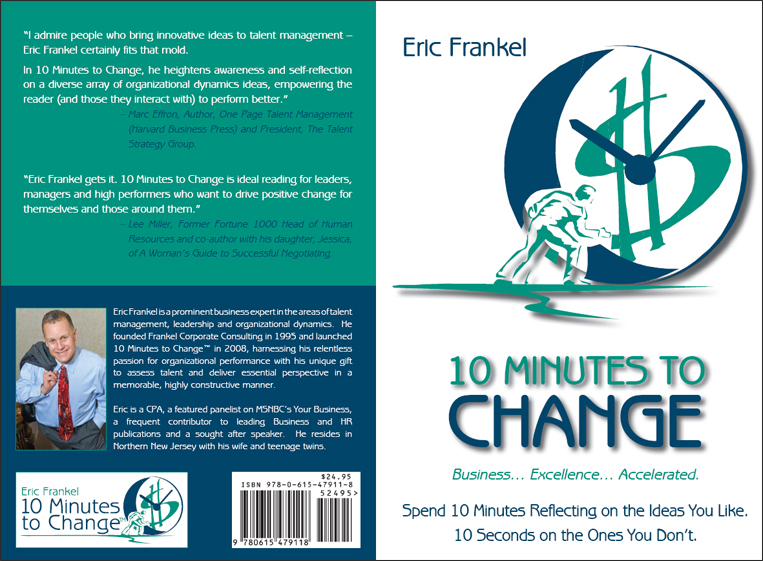 Each of the chapters herein are comprised of random thoughts and wisdom I’ve gathered and observed over the last 16 years of running a diversified management consulting company. These TouchPoints are designed to be read in quick intervals, 10 minutes here, 20 minutes there, whatever your time permits. As you flip through the pages, I caution you to not just focus on the ideas relevant to you and your organization- focus on the concepts "outside your box" to think twice about others' experience and perspectives. Some of the ideas here will pique your interest. Note them with a pen for future reference. For these, spend 10 minutes of your time reflecting on "Why". Some of the ideas here will not be relevant. Move on. Some of the ideas will be in the middle. Use your own judgment of what to do. Read this book to maximize yourself as a well-rounded business person, to better relate to your peers and to optimize your unique and ever expanding Personal Brand. Strive to be that business professionals others’ view as multi-faceted, "well-rounded", a great listener and sounding board. Make sure that diversified is an adjective which describes you, now and in the future. The ideas which pique your interest will allow you to look inward to impact your business confidence, your organizational skills, and your desire to “act of your box”, making you more fulfilled, interesting and impacting for the benefit of those whom you touch. Yes, great leaders are born. But even the best leaders can’t perform unless they are aligned with the right knowledge and the right people at the right time. Leadership traits, instincts and actions must be honed, strengthened and developed over time similar to the muscles in our body or the exquisite taste of a fine wine. Minimize Interruptions to Maximize Focus and Energy - While great for leaders to be approachable, this trait must actually be monitored to drive key employees forward. Employees should not bring up issues unless they have developed a suggested solution and have reviewed it with their manager. Even direct reports must refine their communication with leaders (except for very important, immediate resolution items) to weekly dialogue. At middle management levels, the manager must be more readily available for day to day needs, but the dialogue must still be productive, not interruptive. Leader Interactions Impacts Employee Actions – Leaders ability to influence and impact others (both internally and externally) is immeasurable- when delivered effectively, you escalate organizational engagement and alignment, when delivered the wrong way it is stifling and heightens de-motivation, sensitivity and performance. Sales to Assist the Collections Process – Sales personnel must communicate A/R terms upfront to their customer contacts and share that internal accounting and collections function can be a real bear if these terms are not maintained. If You Are Type 'A', Come to Papa– Segregating customers by sales potential between "type A, B and C" (attention paid, follow up, etc) is essential. Accelerate the relationship with top tier - type A customers and identify, market and sell to prospective customers with this same potential. Divvy out relationships to those who can most effectively handle and drive revenues with these layers. Sales Assessment Requires Direct Observation – No matter how effective sales training, metrics and management are, assessing and enhancing sales skills is predicated on observing their performance in front of the customer. Management and coaching are only partially effective when dealing with “perceptions” rather than a more hands-on approach. Embrace Voice Mails – Some counsel sales professionals to not leave “voice mails”; an antiquated and totally inefficient tactic. Effective cold calling requires persistency, name recognition and some level of trust/comfort before getting the meeting. Voice mail messages allow the prospect to assess interest level on their own terms, also allowing the caller to perfect their communication, delivery and salesmanship (or sales-person-ship).